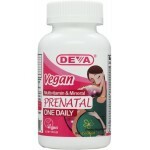 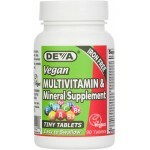 Get a wide variety of essential vitamins and minerals your body needs with DEVA Vegan Multivitamin. 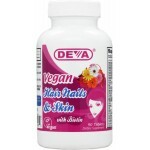 Balanced, multiple vitamin and mineral formula combined with green whole foods, vegetable powders and special herbs suitable for vegans / vegetarians. 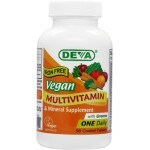 Get a wide variety of essential vitamins and minerals your body needs with DEVA Vegan Multivitamin. 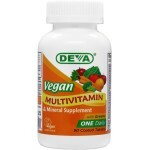 Balanced, multiple vitamin and mineral formula supplemented with green foods/special herbs formulated without animal derivatives making it suitable for for vegans / vegetarians. 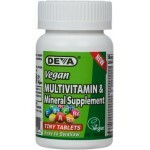 Deva Vegan Tiny Tablets Multivitamin & Mineral supplement provides a range of essential vitamins and minerals in a small, easy to swallow tablet that is ideal for those who have difficulty swallowing large pills.